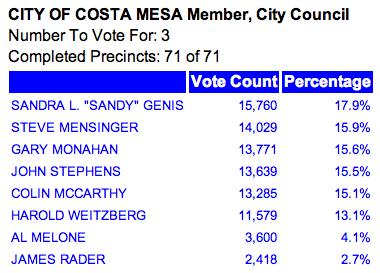 As it stands right now, Sandra Genis added 28 votes today and leads Steve Mensinger by 1,731 votes. He holds a 258 vote lead over Gary Monahan. In the critical race for the third seat Monahan added 28 votes and gained one over John Stephens, who trails him by 132 votes. 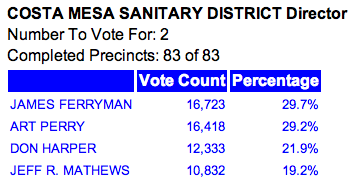 Colin McCarthy, who is 384 votes behind Stephens, Harold Weitzberg, Al Melone and James Rader trail the field. i only hear the crickets....where's the bravado? three men will control the city? thought that's what made the charter bad. buehler....buehler....robin? union quilters have quit making the shawl for the new mayor hopeful who was in waiting...ain't happening. It's what it is for now. Although John didn"t make it on the council, we did score victories. And believe me, there will be a next time, and the next time is Righeimer. Exactly, jw. You have to crawl before you can walk. Wendy was the lone voice of reason among the council, and now there will be 2 to be heard, along with an awakened and aware Costa Mesa. Bever and his patronizing and smarmy attitude will be gone. Monahan will more than likely miss 1/2 the meetings. There is a lot of reason for optimism among those on the right side of the issues. His complete lack of class and etiquette, combined with a grammar school mean streak, has brought shame and humiliation to our city. Stephens may not get on right now, but his time is coming (assuming he would still want the position). WHEN Righeimer is recalled, Stephens may be the appointed one this time around, and unlike last time where nepotism, cronyism and building empires were what mattered, it will be the democratic process being recognized because he was the next highest vote getter. Riggy's days are numbered, he has done much damage to the GOP brand and made a joke of Costa Mesa. He's wasted tons of our $, driven away talented employees with institutional knowledge that provided the services that made our city great...all so he could have his platform that fell flat for him...no one wants extremism in any direction...are you "hearing us loud and clear now" Jim? Yep, you should call yourself "Stanley" because you are a tool. There has been no "bravado" whatsoever on the part of CM4RG. No "we got this", no overconfidence in a slate win. It's been humility and hope (not "hope and change" before you go there). You and yours still don't get it. We want pension reform, we want financial stability for our city. What we don't want is the Riggy clan style of governance. We can have reform without the divisiveness he and Mensy have created. Our city deserves better than what he has brought upon us. I'm nt impressed bya group of men who can sit there and berate and belittle the lone woman on te dais in the ame of their platform and ageda. They lack honor and the lack the discernment and tact that the mantle of leadership should carry. They are singleminded bullies. • You have to show up for every council meeting or else you don't have a majority. • You can't exercise the power of eminent domain (which needs a supermajority of 4) if you've angered any of the minority. • You can't stifle a minority member's motion by refusing to second it, because the other minority member can second it. • Disrepectful comments to either Councilwoman will be rebuffed by both Councilwomen. No more freewheeling disrespectful comments from R, M & M.
• There may be at least two women (councilwomen) at Eric Bever's going away party. • Sandy's comments will no longer be restricted to 3 minutes, but Eric Bever's will. 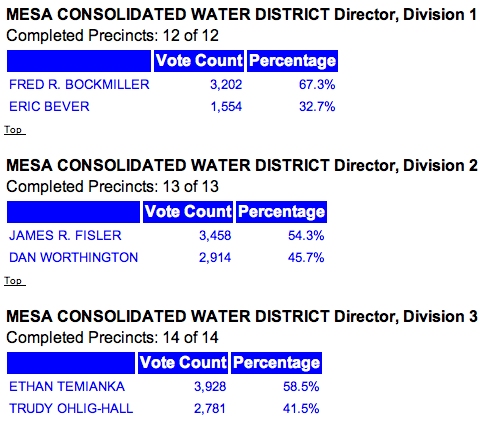 If you tally all council votes and divide the total by three, it gives a close but only approximate count of ballots. If you take that figure from the time when 1504 ballots were left, and the one from today, at 5:00, the difference is 345 ballots, which leaves 1158 to be counted. My data is insufficient to be certain of this number, as I do not know whether the 1504 are all from Costa Mesa or from Orange county at large. The tally appears to increase by something between 100 and 200 every day. So, as far as I can tell, it's still a crapshoot. Has anyone heard from or seen Fitzpatrick recently? I know he had a rough time dealing with the OCGOP slaughter that took place locally and in the County, but I'm really worried about the news I heard today regarding the bankruptcy of Hostess and the stoppage of Twinkies. Somebody please check on him and report back--good or bad. far from done: stephens would have lost to McCarthy if not for ballot position so McCarthy should be appointed to council. that and the other fact that McCarthy has been doing good for the city government for a long time and Stephens just popped up out of nowhere. He needs to do more . Nice guy though. "Yep" recalls don't allow for an appointment. It's a two part ballot. 1. "Should councilman Jim Righeimer be recalled?" 2. "Who shall replace him?" The names for he second question have to have been qualified candidates at the last general election. That means McCarthy will have to hope he can beat Stephens in votes. It also means that he and Riggy and Fitzy should all be on their best behavior should this happen. They can't afford to further alienate the electorate. I see Riggy already making the "I heard the voters loud and clear..." Statements. He has to. At this point he has a lot of group hugs and kumbaya in his future. His approval is in the toilet and he knows it. Keep up with the superiority complex it worked so well in the general election, right? Humility, try it, it wins more votes. Daily Pilot reports that John Stevens has conceded to Monahan. 138 votes between them as of Friday night. Congrats to John for running a great, clean race. Having problems accessing my blog. Must mean it's time for a forced vacation. More next week. Council agenda posted on city web site. Check warrants for latest Jone Day bill. 95 grand! Might be a long night Tuesday. Napoleon was emperor before he was exiled. This will look good on Jimbo's resume when he arrives in Escondido. The 6th Grade Bully Association will hold its monthly meeting this Tuesday immediately following the city council meeting. President Steve-O Mensinger will preview the new film of himself singlehandedly attacking an anthill in South America. He will present retiring Costa Mesa mayor Eric Bever the Biff Tannen Award for managing to bully all the charitable food providers and their senior citizen recipients in a single day. Riggy will get the useless title of Mayor and Mensinger gets the more useless title of Jr. Mayor, And Gary keeps the title of part-time seasonal Council Member. Hey Bever--make sure you turn in that cute little badge when leave and Riggy make sure that you pass along the "Mayor Pro Team" jewel encrusted badge to the new junior Mayor Mensinger. Lets start all the required paperwork to transfer and account for these badges early because we sure don't want to deal with more missing badges and have to cost the taxpayers more wasted money. Why the weird comment about McCarthy should be appointed? To what vacancy? Could the rumor about Gary resigning be true? Since they only got 2 seats will he still do it? I know he needs to. Now that Sandy got first place how does he feel about those lies he sent to the Daily Pilot? He wanted to knock her down but that didn’t happen. She’s first, he’s last. I know Gary knew better; question: Is he man enough to apologize? Class act all the way CM4RG. Thank you all for all you did for my community. Don’t stop now. Next time you have a membership drive I’ll pay my dues!